Good Early Morning Stamping Friends! I'm here with my April challenge post for the Crafters of Faith. April is our host this month & she asked us to make our creations with flowers as our theme & we could include rain if we wanted. Well; I just went with the flowers since it's so very easy to make something with them & I decided to leave the front blank so that I can use this for any occasion. I also added lots of texture & some pearls as a finishing touch! Thanks so much for a fun challenge April! To see what the rest of the girls came up with; look on the left hand side of my blog for the Crafters of Faith! Thanks so much for stopping by & stay tuned for my last post as Guest Designer for Loves Rubberstamps! this is such a pretty card jackie!!! i love how soft and feminine you can make your cards... mine always come out so... not-soft and not-feminine lol! What a beautiful card hun. Love the embossing and soft colors. Beautifully done. Stunning Card Jackie--I love the design and the colors! So beautiful. I love the soft colours. Very pretty & feminine! Thanks for joining us at The Cheerful Stamp Pad! Jackie, you make the most amazing cards with this stamp set! Love the soft colors and embossing. great job on the challenge, friend! Beautiful card, love the soft pale colours. Thank you for joining us at the Cheerful Stamp Pad this time. 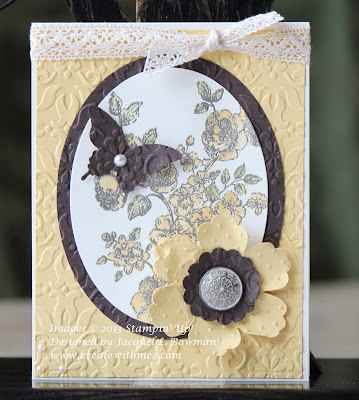 Very elegant, love the embossing and your vintage design is gorgeous! This has such a wonderful feminine and vintage style! Beautiful card! Gorgeous! Love the lemon yellow, the butterfly and your gorgeous layout! Thank you for joining us this week at Love to Create Challenge Blog. Gorgeous card. Love the color combo and image. Thanks for joining at Artistic Inspirations this week. Fabulous, Jackie!! What a lovely color combo and so striking - as always your cards make me smile :) You have such a soft touch to your cards! Blessings! So simply classic. Thank you for joining with us over at Love to Create Challenges. Jackie--your card is stunning! Love the colors and the layout.